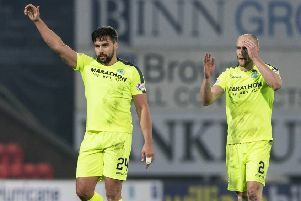 Claims that Hibs are close to shaking hands on a deal which would see Edinburgh Rugby play at Easter Road next season were today booted into touch by chief executive Leeann Dempster. SRU chief Mark Dodson revealed earlier this week that talks had taken place between the two parties, leading to hopes in rugby circles that an agreement could be reached for Edinburgh to play “a couple of home games” at the football ground. Edinburgh currently play at the 67,800 BT Murrayfield Stadium yet have an average home gate for Guinness Pro12 League matches last season of just 4845, the matchday experience criticised with so few fans in such a vast arena. As such, the SRU are desperate to find a new home for Edinburgh Rugby in the Capital, wanting to replicate what the Glasgow Warriors fans are enjoying at Scotstoun where a real buzz has been created by an average gate of 6676. However, in a wide-ranging and exclusive interview with the Evening News, Dempster insisted her counterpart at Murrayfield had overstated the current state of play, revealing it’s a conversation which has taken place on a number of occasions but, as yet, they are no closer to any agreement. She said: “It’s not a potential partnership, it’s a potential to discuss, if you know what I mean. The truth, I think, is that there have been discussions between the cub and SRU that have run over a number of years. It was live last year, an exercise of ‘is there a possibility,’ but at that point last year we had too many things to focus on. Dempster has made no secret of the fact she’d like to see Easter Road put to a more diverse use, keen to push up the club’s revenue streams, and while ground-share would have it’s attractions in terms of a rental fee and the possibility of Edinburgh Rugby moving their offices and shop across the city, there were many other considerations which would have to be taken into account. Not least of them, as raised on Hibs fans message boards would be the implications for the pitch, particularly with the majority of Edinburgh’s home matches taking place on a Friday night, throwing up an obvious conflict should Alan Stubbs’ players be due to play on their own turf the following day, particularly in the throes of a Scottish winter. Dempster said: “We have talked about community use of the stadium, the diverse use of it on a non-matchday and I guess that discussion falls into that. We have to consider the upsides and downsides and decide collectively if it is something we want to pursue.